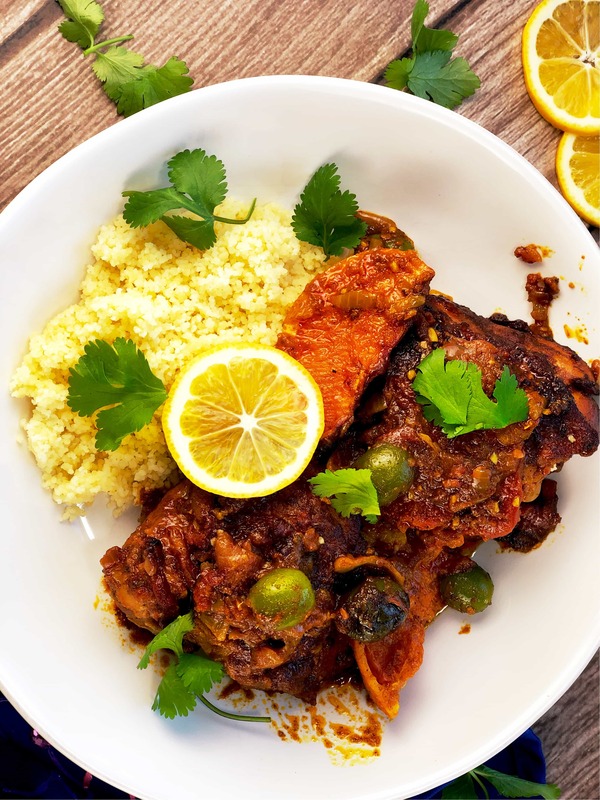 Adapted from a recipe from Geoffrey Zakarian that I saw on The Kitchen, this Citrus Chicken Tagine doesn’t need a Tagine, just a deep enough dish to saute in and go into the oven. I used a large Dutch oven for it. The prep time for this is relatively short, but the cook time is long, since you cook it low and slow to make the chicken thighs fork-tender. You won’t be sorry for putting in the time. Promise! I served the chicken with couscous, but you could serve it with na’an, rice or noodles! Preheat oven to 325F. Heat a wide braising pan, or a Dutch Oven or Tagine, over Medium-High heat. Next, In a small bowl, mix together the harissa, smoked paprika, turmeric, cumin, ginger, cinnamon, coriander, allspice, cardamom, cayenne, zest of the two Cara Cara oranges, and 2 Tablespoons of Canola oil. Stir until a paste is formed. Season chicken thighs with salt and pepper. Then, rub half of the paste over the chicken thighs, making sure they are coated top and bottom. Pour the remaining 2 T Canola Oil into the hot pan. Place the thighs, skin-side down into the oil. Leave for 5 minutes. They should be golden brown and easy to turn at this point. Turn and cook until other side is golden as well, another 4-5 minutes. Place thighs on a plate and set aside. Into the pan, add the onion, remaining paste, and the garlic. Use a wooden spoon and scrape any browned bits from the pan. Cook until onions are softened and lightly brown, about 5 minutes more. Place the chicken pieces atop the onion mixture, then add: tomatoes, (crushing with your hands), stock, olives, apricots, preserved lemon, orange slices. Season with salt and pepper, remembering the preserved lemon and olives add additional salt. Braise in oven, partially covered for 1 hour, 15 minutes. Uncover and continue to braise 15-45 minutes longer, until chicken is fork tender.